Parenting lesson #42: 21 anythings to make or break a habit. The idea just popped into my head. She finished. And do you know what happened when she came home from going out with a friend for the afternoon? She walked in the door, went right over to the boot tray, took off her boots, and put them there. I know this doesn’t necessarily mean it’s going to be a habit or will stick. But just last night, she proudly said as we came in the door, “Look, mommy, I’m putting my boots where they go. Time will be the judge of that. But I’ve always heard that it takes 21 days to make or break a habit. What if it’s the same with muscle memory for tasks such as clearing a plate after eating, hanging up a coat, or washing hands after going to the bathroom? If this truly sticks, I’m going to use it over and over and over again. At least 21 times. Parenting lesson #41: You have to clean up your messes. Being essentially bedridden (on the couch) with my injury, I’m amazed at how many messes my children make that they don’t clean up, especially when all three are home all day. Have I not taught them how to clean up after themselves? No, that’s definitely not it. I’m certain I’ve shown them millions of times. They. Simply. Don’t. While sitting here in wonderment about the clean socks strewn all over the couch, I have stumbled upon this two-year-old piece I wrote called “You have to clean up your messes.” And I am marveling at how much repetition is required for teaching young ones … as well as old ones. One of the most cyclical parenting lessons is how our kids show us daily how little we know and how much we still haven’t mastered. Because we are constantly learning and evolving and becoming. Enjoy! Last week, I had to teach Zach a lesson, and it was really painful for both of us. I asked him if he could take out the trash for me. I warned him it was heavy and he might not be able to get it up and into the can. He came back in and said he did it. I said, “Wow, you didn’t have any trouble?” He said he didn’t. Late that night I was ready to go to bed but the dog had not returned to the door to come in. Greg was out-of-town and it was 20 degrees. I was not about to go looking for her. I turned on the lights in the back; no sign of life. I checked through the windows to make sure all the gates were closed. They were. Since she’s 14 ½-years-old and deaf, I couldn’t call her name and get her to come. So I waited. And waited. Finally, I caught her right out the window, got her attention, and had her come in. I was fuming, not only because the dog had gotten to the trash, but because Zach had lied. I decided to leave the mess for him to clean up. We didn’t get home until just before dark that afternoon, and I told him he had to hurry. In my unending graciousness, I decided to help him. As he looked at the trash, he fussed and moaned and groaned and whined. We got our large dust pan and broom and I began to help him. As tears streamed down his face, he agonized, “This is SO DISGUSTING! I’m going to BARF!! !” Perhaps the worst part was that I had cleaned out their art supply caddy the day before when they were at school. What that meant is I threw out some “priceless gems” without telling them (as we have ALL done). As he choked back tears and bile, he also wondered aloud how I could get rid of his Frankenstein notepad without telling him, and why I would do such a horrible thing in the first place. It’s these moments when doing the right thing can feel so wrong. It was probably the worst 10 minutes of my week. It made me feel bad about cleaning out their stuff, and it made me feel like I was a bad mom to make him clean up the mess. It’s these moments when doing the right thing can feel so wrong. Our kids are so good at making us feel like we’re bad parents when the opposite is true. There are consequences to lying, and when you make a mess (or are responsible for one), you have to clean it up. These are life lessons we must teach. If we do these things for them, we’re doing them a disservice. College is not the place to learn that your trash goes in the can, you have to put it there, and if you leave it out and a dog noses through it, you have to clean that up, too. I’ve been called the worst mom in the world. That happened a few days later when I made two of my three stay home with me for bickering while the other got to go out with friends who were visiting. And I told my child, “When you say that to me, I know it means that I’m actually a good mom.” And later that night, I got some of the best cuddles from that very same child. Everybody lies sometimes. And we all make messes. The mess I had to clean was owning up to throwing out Zach’s prized art materials. I apologized and he forgave me. I did not promise not to do it in the future because I know I probably will. If we kept everything the kids brought into this house, we’d be featured on “Hoarders.” And so, as an adult, I’m capable of making that judgment about some items. But I have learned, after many tears, that I should check about some items first and give the kids the chance to store things in their rooms if they truly cherish them. I also know better now that if I’m going to secretly trash a Happy Meal toy, I’d better be the one who takes out the garbage. Learning, growing … becoming. I can’t wait to do more of these things in 2019!!! Parenting lesson #6: Birthing is not the height of parenting pain; it is the beginning of it. Pre-bedtime dance parties can be super fun. They can also be dangerous. Tonight, after finally hooking up a radio in the boys’ room, Ethan was so excited to hear the Biebs that he jumped right into my mouth. Like his head collided into my chin. I got a fat, bloody lip and my teeth are still hurting. And it got me thinking about how wonderful parenting is while simultaneously being painful. There’s no better lesson about how life is a journey with the good, the bad and the ugly like having kids. My kids are 8, 7 and 3 now. They’re not old, but they’re not young. I’ve struggled about whether to blog about so many things because now that they’re getting older, I want to respect who they are becoming and I don’t want to share things with the world that might be too personal. Everyone knows two-year-olds are crazy, demanding Hitlers, so it is funny to write about them. But when those two-year-olds are 8 and they tantrum, or are 7 and cry over every little thing, it seems like stepping over a line a little to write about them and their struggles. (This is partly why I simply haven’t blogged much.) But in order to be authentic, you have to be real about all parts of life. And the reality of having children is that it’s messy. And painful. Physically painful sometimes, yes. Emotionally painful, absolutely. Mentally painful, you bet. So if you’re embarking on this parenting journey, you’re in for quite the ride. If you have a crazy labor and delivery story (like just about every woman I know), I can relate to your pain. And I can also honestly say it’s just beginning. But it is all so very worth it. There’s no one I’d rather dance with at 7:30 at night to “Sorry” than over-exuberant Ethan. Even if it means I’ll get a fat lip. I’d do it again tomorrow night in a heartbeat. It’s possible my last post made me sound like an amazing parent who always sticks to her guns, never issues empty threats, and never goes back on what she says so her bipolar two-year-old will respond perfectly to every situation by age three. Thursday is a great example of a time when I absolutely caved. I had just dropped off my older two at school. Let me digress a little by letting you in on the fact that Ethan is obsessed with lip balm. In fact, recently after I told him he couldn’t have my lip balm, he took my secretary table where I keep the lip balm and flipped it up, spilling my full cup of coffee into all of my makeup. But that’s another post. This is but a glimpse of the coffee mess. This was that parenting moment. That moment when you KNOW you are sending a mixed message. When you know you shouldn’t say “No” and then give your child what he wants in the next second, but you’re just too darned drained and tired to keep bantering. It’s also the moment when there is a high risk of things ending badly, but for the momentary relief you so badly want from the badgering (or noise, or sibling spats, or whatever the case may be), you cave. You make what you said just moments earlier a lie. No kidding! His hands, seat belt, and jacket were so artistically smothered in berry lip balm. We simply can’t get it right all the time. There is no perfect parent and it is impossible to be 100% consistent. But also, it’s not necessarily inconsistency if our children are able to convince us to change our minds. I actually think it’s important for my children to know that they do have negotiating and reasoning power with me, especially with my older two. Sometimes Eliza and Zach convince me to change my mind about giving them a treat, or having longer to play, or, really anything. And when they do, I get to share with them the reason I have changed my mind. When they’ve made a great point (“But mom, I already finished my homework and we’re getting along so well!”), I can recognize it. And when I’ve changed my mind for no explicable reason except that I’m buying some peace and quiet, I use it as an opportunity to explain grace to them. I like connecting these dots for them. I connect the idea that sometimes we get things – good things we want – for no reason at all, but simply because we exist and are loved. I don’t believe that Ethan can grasp that yet, but I still tell him that’s what he’s getting. My older two began asking me for grace when they were three or four, so it’s not far off. For now, I need to remind myself that sometimes, giving in, or turning myself into a liar, is worth the 20-minute drive of quiet when I am able to string some cohesive thoughts together. And cleaning up smeared lip balm is also worth it. A lot of parenting is weighing the various options in the moment and picking that one that works best in that situation. There’s hardly ever one, black-and-white, always the right response. And THAT’s no lie. Parenting lesson #20: Some lessons must be learned over and over. And over. 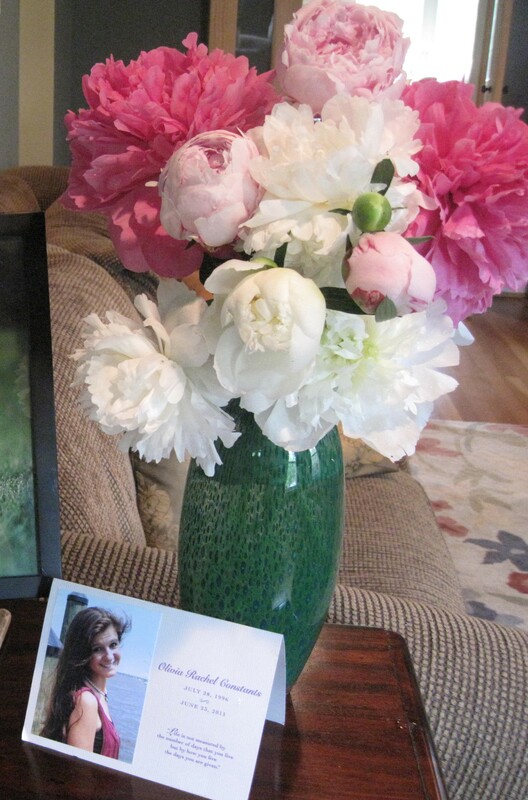 Olivia’s photo at our front door with peonies, which fittingly represent healing and life. I’ve never before re-posted a blog. But I’m amazed at how easy it is for me to lose perspective. Sometimes I revisit my old posts because I need to re-read the lessons I thought I had learned. Originally, I called this post “I submit there are three certainties in life: death, taxes and poopage.” Amazingly, the past 24 hours have not only involved poop (and the remembrance of a death), but also dog vomit and pee. Of course, they have also included an out-of-town husband and a sick toddler, and with my third child, that means a menace who goes from extreme clinginess accompanied by inconsolability, to running around and destroying things like the Tasmanian Devil. I think once you have more than one child, it’s all just chaos, and whether you’re cleaning poop off your flip-flop or vomit off the rug, it’s all just part of a day’s work. The lesson I need to be reminded of is that these ARE the good days. There are tough moments, but the days are good. They are blessings. I didn’t graciously respond to every inquiry or issue today — far from it — but I’ll take it. I’ll take all the above, because the alternative is devastating. Yesterday, our dear friends marked four years since their daughter Olivia died unexpectedly. FOUR YEARS. And I can assure you, the pain of the loss is so slowly ebbing. I still keep her photo in our living room as a reminder to treasure all the moments. And remember to hug and kiss your babies tonight one more time in their sleep because they are still here. Well, this morning somehow within about two minutes Zach not only managed to step in a fresh, wet pile (why it couldn’t have been a sun-dried one, I’ll never know), but he also managed to get some in his hair. I’ve been so struck by how much EVERY moment is a gift. Though not likely, and certainly not fun to think about, any moment could be my last moment with one of my precious little ones. And I’ve really pondered that these past couple of weeks. When Zach has been waking me up (almost nightly for a reason I still haven’t determined, but I think it’s nightmares), in my tiredness and frustration, I’m trying to feel blessed that I can hold him and touch him and comfort him. When Eliza and I have one of our 72 daily conversations that exacerbates my patience, I’m trying to be thankful for her inquisitiveness (or desire to be annoying – I am not sure which it is yet). and I try patiently to come up with an answer (my favorite these days is that I don’t have to explain myself to her and she should trust my judgment). But back to my point, I guarantee that if she weren’t here tomorrow to ask me these questions, I would give anything (an arm? a leg? all our assets?) for one more annoying moment with her. And if something happened to Zach, I would give anything to clean the poop off of his shoes again if I could have one more of his amazing hugs. So in my grief, I want to encourage you to enjoy the gross and scary moments before they’re gone. And in the words of Steve, go give your babies a hug and a kiss, just because you can.